Chris Collins joined the CCGD staff in January, 2013. 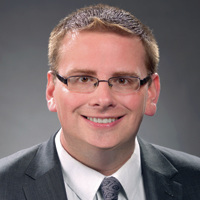 Collins came to Dallas from Eugene, Oregon, where he held the role of General Manager of the Eugene Symphony, a position he held since 2008. As General Manager, he was responsible for overseeing the artistic operations of the orchestra, including all areas related to artistic administration, production, personnel management, and educational programming. Under his leadership, the Eugene Symphony saw a 56% increase in participation in its education and community engagement programs (from 16,000 to 25,000 people annually), received one of the largest grants in the organization's history, and launched several new artistic initiatives. As Executive Director, Collins collaborates with CCGD’s Artistic Director, staff, board, and volunteers to meet the artistic, earned and contributed revenue goals of a nationally renowned children’s chorus. Under his leadership, CCGD has seen a 44% increase in contributed revenue, a 28% increase in single ticket revenue, a 74% increase in annual concert attendance, and record enrollment. He facilitated CCGD being named the official children’s chorus of the Dallas Symphony Orchestra and also led an organization-wide two-year strategic planning process designing an agreed-upon set of long-term goals and accompanying five-year strategic plan. As a violinist, he has performed with numerous orchestras in Arkansas, Colorado, Oregon, Texas and Wyoming. Mr. Collins holds a Bachelor of Music degree in Violin Performance from the University of Northern Colorado in Greeley, and both a Master of Business Administration and Master of Arts in Arts Administration from Southern Methodist University in Dallas, Texas.